Managing the late pregnant ewe to kidding is one of the most important periods in the production cycle on the farm. Providing an energy source to pregnant ewes during cold periods especially if placed in a shed during the passing of a cold front. Results in low birth weight and ewes’ discarding kids. The nutritional requirement of a late pregnant Angora ewe is known to increase 2-3 fold compared to that of a dry ewe. This figure is too often forgotten or underestimated. 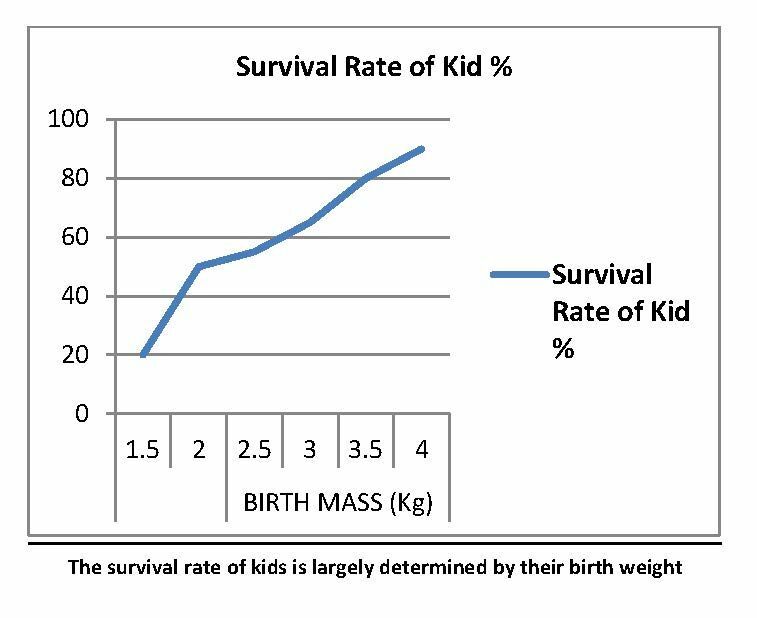 Birth weight of kids largely determines the survival prospects. 80% of the kids that die do so in the first month due to decreased colostrum, milk supply and poor mothering (ignoring the jackal for a minute). During cold weather it is important to remember cold stress increases glucose consumption by up to 66%. This is aggravated by restricted grazing at times when goats are placed in a shed during cold raining weather. Abortion usually then occurs 1-5 days later. Pregnant ewes should therefore when possible be given supplementary feeding when housed. 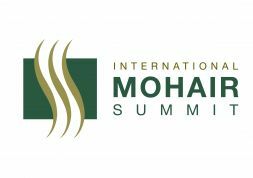 Feeding molassess sugar is not as effective as starches (grain/maize) in increasing blood glucose. Why is energy so important in a pregnant Angora ewe compared to sheep ewe? In a ewe which is energy deficient there is a decrease in blood glucose level which is passed on to the foetus. This triggers a stress-response by the foetus, causing a rise in cortisol (steroid) production. As these steroids are oestrogen precursors, this has the ultimate effect of increasing oestrogen production. This causes the regression and eventual destruction of the Corpus Luteum (CL), the area of the ovary responsible for progesterone production. In goats the CL is the only source of progesterone and is solely responsible for maintaining pregnancy, whereas in sheep, progesterone is also produced by the placenta. For this reason, sheep are significantly less likely to abort during energy shortages. The aborted foetus is usually well formed, normal in appearance and sometimes still alive when aborted. When energy is supplemented appropriately, abortions will typically stop within two weeks where under nutrition is the cause.. The only source of Vit A for the kid is via the colostrum as it does not cross the placenta. Vitamin A is synthesized from carotene, which is present in green plants. Deficiency can result in birth defects and negatively affect immune status. Multivitamin (ADE) supplementation should be considered especially under winter grazing conditions. Trials conducted indicate that weaning % can be increased by 4.6 % in Angora goats when supplemented with minerals Manganese, Zinc, Selenium 4-6 weeks before kidding. For the most effective colostrum transfer of antibodies through the kid this is the best time to vaccinate your ewes. The Angora goat’s resistance to roundworm infection is generally poor compared to sheep. The physiological stress placed on the ewe during late pregnancy and lactation decreases their immunity level even further. Studies have demonstrated that 5% of L3 stage wireworm larvae picked up from the vegetation establishes as adult worms in a normal adult dry ewe. During late pregnancy and lactation this increases to 30-40% due to the ewe’s poorer immune response during this period. Furthermore environmental conditions become more favourable for roundworms during this time. The result is that there is increased veld or pasture contamination with roundworm eggs which the kids then start picking up. The effect of nutrition vitamins and minerals on the immune system again emphasises its importance. 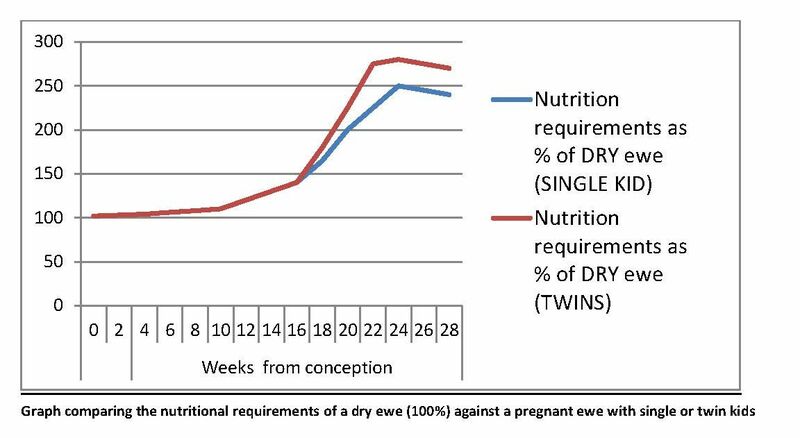 By paying close attention to these factors and giving appropriate supplementary nutrition during late pregnancy in the Angora ewe, the risk of abortion may be reduced and the kidding percentage, health and growth rate of the kids maximised.